The Hero Quest board game is Milton Bradley’s answer to Dungeons & Dragons. Or as some of us like to call it, “The poor man’s D&D”. As fun as this is interesting, Hero Quest offers a watered down roleplaying game experience. At a glance this game is fun: however, the gameplay is very stagnant. As a veteran roleplayer of twenty plus years, this game offers little in the way of fun and excitement. However, if you’re between the ages of 9 and 12 (and if you can find one for a reasonable price — try looking on eBay.co.uk , because the game comes from the UK — Ed.) then this game is for you! One player becomes the Game Master and the others play a menagerie of wizards, dwarves, elves and barbarians. The Game Master sets the stage for the story behind the board game setting and works the players trough a dungeon where they have to face many obstacles from vicious monsters to tricky traps. The players use their character’s abilities and weapons to survive these encounters and make it to the end of the dungeon. There are pretty cool elements in the Hero Quest board game. The game is entirely three dimensional. It includes moving doors and traps and other small accessories, as well as small plastic miniatures which can be used in other games. The game also affords a variety of expansions which add to either the story, the board or the characters and enemies. So one isn’t stuck running through the same dungeon all the time. Unfortunately the drawbacks are a bit steep. The creativity isn’t there. Once you have exhausted your expansions and your main board game, you’re forced to work through it all over again. True, you aren’t running though the same dungeon setup all the time, but the challenges become the same and after a while, one knows the key to everything. 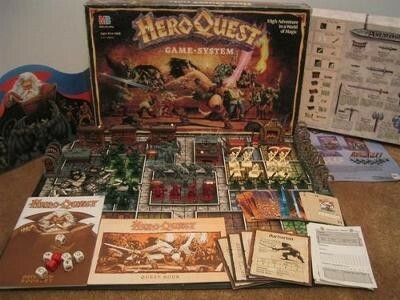 In the end, Hero Quest is a board game that offers a nice fast and easy-to-play fantasy game. All in all it is a very friendly and easy game to comprehend. Where some roleplaying games don’t offer much in the ways of family fun, Hero Quest does. The whole family can play and have a good time as if they were playing any other more mainstream board game. Personally I like Hero Quest, cause I’m such a fan boy of the genre. However if I had to be a third party observer giving my honest unbiased opinion, this game is only worthwhile if you’re not looking for much. If you’re an avid D&D player this will not be for you. However, if you just watched Lord of the Rings and want to fight some Orcs in a dungeon this is for you. Click here to search for HeroQuest games on eBay.co.uk: there’s many more available, including expansions, so if you’re prepared to pay the shipping, it’s a much better bet than the .com site! Oct 23, 2014 Fantastic Game. This is an incredibly fun game. My family and I have been playing it since it first came out. As far as replay value, if you have an ounce of imagination, you can easily create your own quests. My brother, myself and our friends started playing when the game first came out. Now my daughters and I play it on a regular basis. It is a combination of board game, dungeon crawler, and a R.P.G. We have added more miniatures to expand the gaming experience. If you enjoy fantasy games, this is a must own. This game is an awesome game for anybody looking to get started into an RPG. The basic rules for dice and standard rules of the game, make it easy to understand but still challenging to complete.